Our main objective is to create powerful tools for the developers who build WordPress sites. 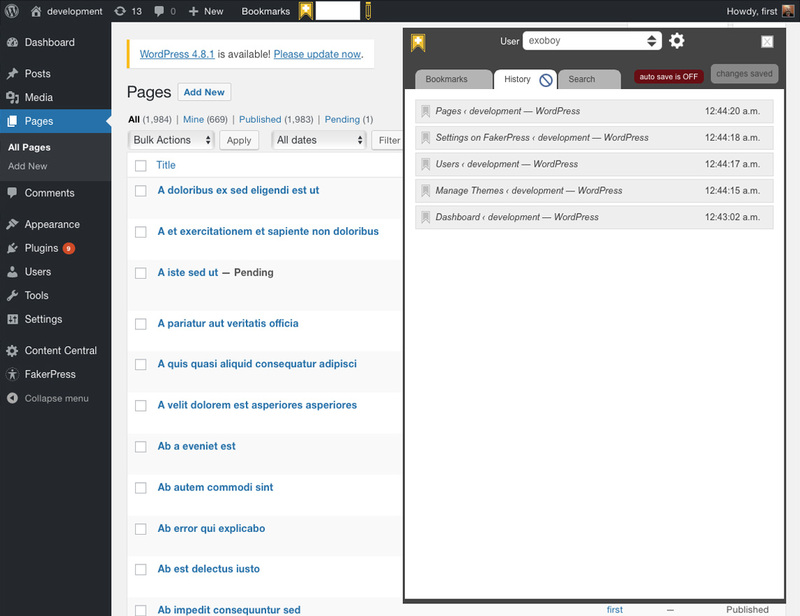 WordPress can be a great content management tool. It enables many less-than-technical folks the ability to control their own content. But, there is a distinct lack of tools that help developers to tame the admin environment itself. From search, to organization, there is no streamlined, scalable way to customize things the way your process works. We look forward to putting a little turbo into your work flow. 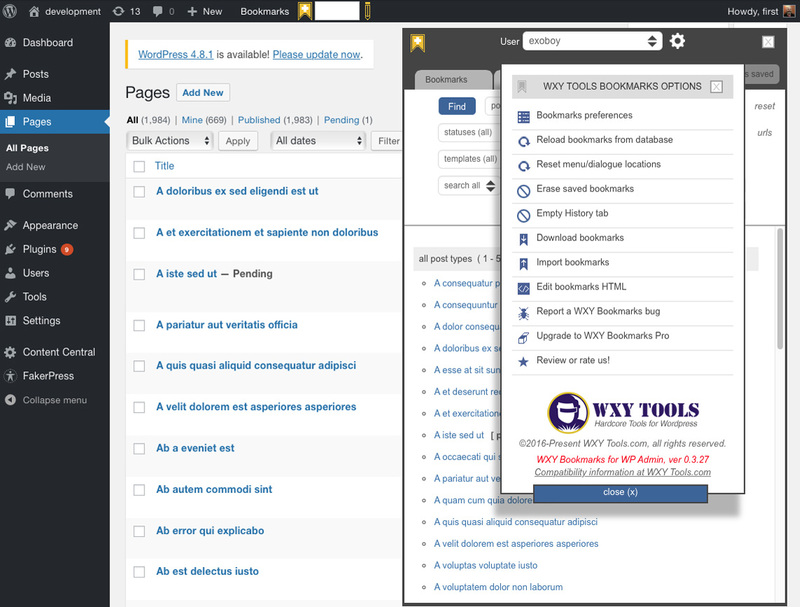 Visit try.wxytools.com and you can sign in to a WordPress Admin Panel that allows you to experience all of the tools and features of the WXY Searchmark plugin! Create bookmarks, navigate to pages, perform serarches, save, delete, and all the features and options. Try it and we think that you will agree, this is one of the best, scaleable, most useful plugin-ins to come along in a very, very long time! Bookmark anything that has a url within the admin panel, such as pages, posts, buttons, links, if it has a URL, it can be bookmarked! Nest folders inside of folders. Import saved bookmarks from your desktop. View and edit the HTML for all bookmarks and folders. Color code folders and bookmarks. Easy, drag-and-drop organization of bookmarks. Bookmarks menu is ever-present – no need to go to a different panel. Each user account has its own set of bookmarks. Rename bookmarks and folders to as long a description as you like. 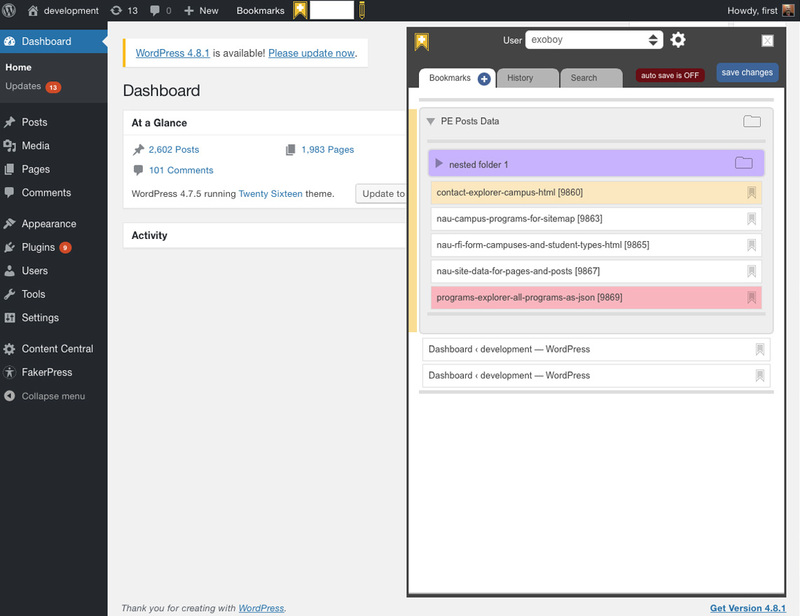 Supports multiple users - each person can have their own custom set of bookmarks. Import/export bookmarks for easy backup and sharing. View all bookmarks' HTML for the ultimate in control. Full drag-and-drop capability to organize your bookmarks and folders. Newly added bookmarks contain the post/page id by default. Change folder and bookmark colors to help with even more visual organization. Folder/bookmark descriptions can be as long as you want and can contain HTML. Easily choose between seeing a bookmark's preview, or edit screen. Edit all URL's assigned to your bookmark for total customization. Delete one or multiple bookmarks with a single click. Duplicate one ore multiple items with a single click. Auto-save feature makes sure you never lose changes as you work. Or, if you want total control over when and what to save, you can turn auto-save off. Persistent bookmarks scrollbar location - never re-scroll to the same place again and again. When a folder is open, colored indicator lets you know which is the currently active folder. Activated folders automatically capture all newly-added folders and bookmarks. When you switch tabs, they stay persistent, even after page-reloads. 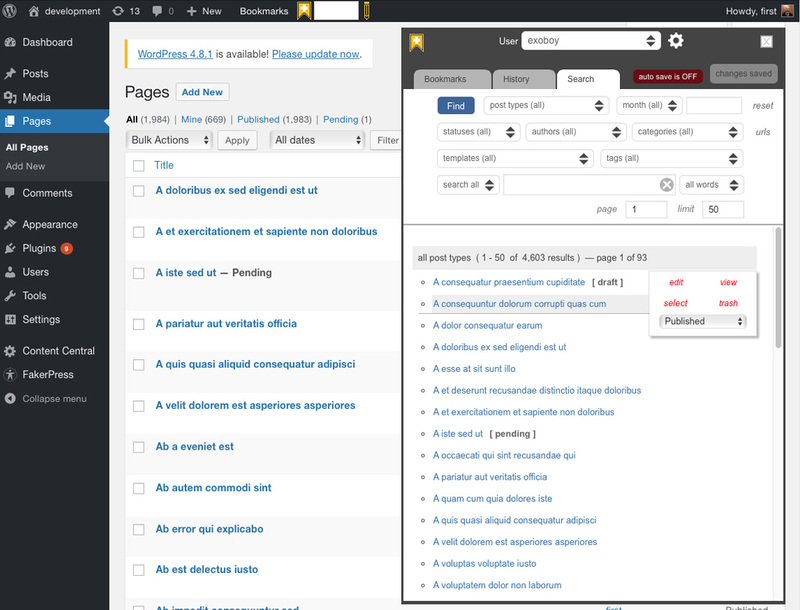 Search in pages, posts, custom types, or all at the same time. Search in titles, content, slugs, or in all places at once. Search by status — private, publish, draft, pending-review, or any other custom status type. Sort search results by title, slug, type, date, status, author, category, template and tag in either descending or ascending order. Enter your own custom starting page and page-size limit. Perform a search for any word in a group, all words in a group, or an exact phrase match. Case-insensitive search makes matching easier. The search form automatically highlights search fields that have been altered. Reset the search form to defaults with one click. Infinite scroll automatically handles from one to thousands of result pages without bogging down browsing. Search results browser displays the status all pages/post types. Hover over result entries to activate sub-menu of options. Multi-select with keyboard shortcut to perform the same action on multiple entries. Easily change page/post status's with entry drop-down menu. Jump to post/page content or preview with just a click. Put one ore more items simultaneously in the trash, right from the results list. Post types select menu give current count of entries in the WordPress database. Search results come with stats like total results found, which set you are looking at, which page you are on and the total number of pages in the result set. Save search results as bookmarks with a simple click! Save search form as bookmark and re-run with just a click! Show the last 500 locations you visited. Time-stamped so you know how long ago your last visit was. Multi-item select to perform the same action on many entries at once. Easily turn history entries into permanent bookmarks. Return to the location of an entry simply by clicking. Resets after the end of each session, so no clearing any caches! Clear the entire history manually with just a click. Many new search features have been added, so this video is out of date, but still gives a good overview of the general concept. We will be posting a new video soon! WXY Searchmark is currently only available as Beta and so is not for sale. However, if you would like a free copy, just become a beta tester! We are currently entering the beta testing phase of our project, but we have a limited number of slots available to the public. View our plugin's overview video on Youtube.com, then contact Clarence Bowman if you are interested in being a beta tester. If accepted, you will receive free, ongoing releases, plus a final version upon successful shipping and up to three years of complete support. Join us at WordCamp 2017 in Salt Lake City, Utah! — On Saturday, September 23, 2017, WordPress developers from all around will be in attendance to discuss and debate all things WordPress. And we'll be there giving a session on better admin navigation for large websites! Visit their website for complete details and to get tickets. See you there! WXY Tools.com, a division of BowmanDesignWorks.com.